This article starts with a loud and friendly warning: if you want to perform one of the great musicals from R&H Theatricals *PLEASE* contact one of our great customer reps or visit our amazing website and go through the painless application process. 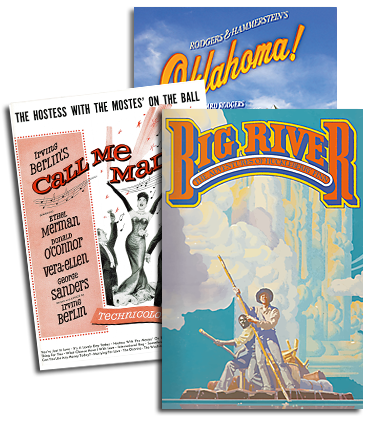 However, if you just want to curl up in your easy chair and revisit the lyrics and dialogue to a classic musical like OKLAHOMA! 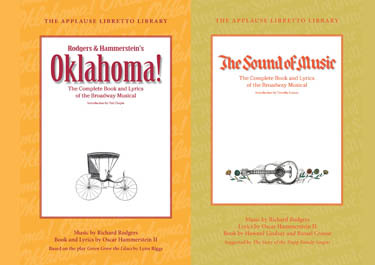 or THE SOUND OF MUSIC, or if you want to study one of those colossal musicals with your students, then you will definitely want to run out and by the brand-new commemorative editions of librettos for Rodgers & Hammersteins very first and very last musicals. "These editions were always meant for reading," writes Chapin in his Introduction to the series. (And yes, we hope that more R&H titles will follow in this Applause set.) "As one who, at a certain point in his life, collected the hardback editions of Broadway plays and musicals, I am thrilled that Applause has decided to take up the mantle of creating readable librettos of musicals. It is a tradition that needs to be encouraged!" The R&H musicals are not only great to read on your own; scenes from this classic canon can enhance any scene-study or musical performance class. With that in mind, working once again with our good friends at Applause Books, RHO developed a scene study book from our musicals the very first scene-study book for musical theater. Scenes from 10 R&H musicals are featured here in MUSICAL SCENE STUDY: THE MUSICALS OF RODGERS & HAMMERSTEIN, and includes an Introduction to the musical from which it was taken, a description of the characters involved in the scene and a note about the preceding dramatic circumstances. For each scene the dialogue, stage directions, lyrics and piano/vocal score for the song are included. This book is a must-have for musical theater students and fans alike and isnt that just about everybody?